Just like Monique, this Mango & Mandarin Curd lights up the room. 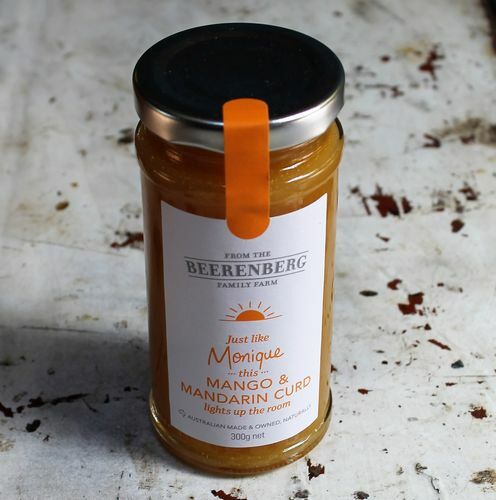 Every day is a good day with the Beerenberg farm shop manager. Bursting with tropical tangy flavours, she lavishes it on everything from toast and pancakes to filling a sponge for afternoon tea and a chat. Chocolate Dessert Sauce, Red Wine Garlic Mustard, Apple sauce, Chilli Jam, Hot Tomato Chutney, Mint Jelly, Mustard Pickle, Red Pepper Relish, Spiced Apple Chutney, Takatala Chutney, Worcestershire Chutney, Mango Chutney, Balsamic Beetroot Relish, Caramelised Onion, Fruit Chutney, Green Tomato Pickle, Spicy BBQ Caramelised Onion, Sweet Chilli Relish, Tartare Sauce, Cranberry Sauce, Blood Orange Marmalade, Caramelised Fig Jam, Fig/Almond Jam, Fig/Cinnamon Jam, Orange marmalade, Quince Jelly, Redcurrant Jelly, BBQ Sauce, Tomato Sauce, Garlic Sauce, Pepper Steak Sauce, Sweet Mustard sauce, Sticky Rib Sauce, Worcestershire Sauce, Cooper’s Ale sauce, Peppercorn Sauce, Smoky Bourbon Sauce/Marinade, Spicy plum Sauce, Blue Cheese Dressing, Honey Mustard Dressing, Parmesan Caesar Dressing, Burger relish, Corn Relish, Mezze Relish, Mushroom sauce, Roadhouse Steak sauce.